It’s no secret that Brits flock to the Canary Islands in winter and the reason is simple, it’s the closest destination that guarantees a warm Christmas. 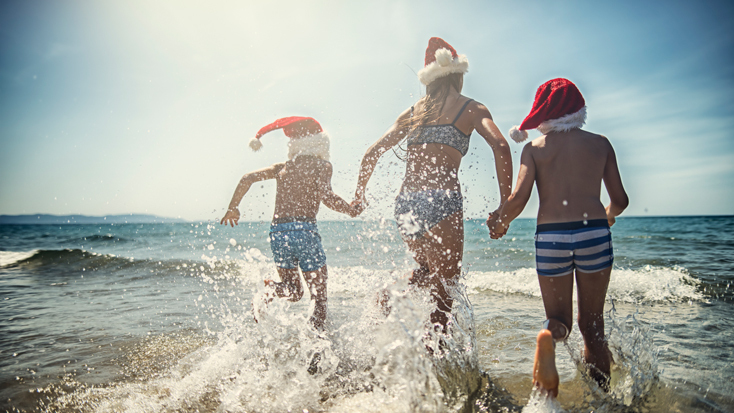 With a wide range of islands to choose between, you can pick the Canary Island to match your ideal Christmas. Touch down in Tenerife to join hosts of carollers as they recite everyone’s favourite songs each night before the big day or make your way to Las Canteras Beach in Gran Canaria to discover a huge hand-sculpted nativity scene built on the beach. Wherever you go you’re sure to be both warm and surrounded by holiday cheer. Try to stay through to the 5th of January if you can as the islands are visited by the three wise men from the nativity, bringing presents, fireworks and more to the revellers. For a completely different Christmas experience, head a little further south from the Canary Islands to the volcanic archipelago of Cape Verde. While these rocky islands are far removed from the typical festive scenery, if you look closely you’ll find a surprising amount of Christmas cheer. Instead of putting up a Norwegian spruce, some people in Cape Verde build incredible trees from bunches of bananas and on Christmas Eve it’s traditional to party throughout the night with Santa Claus. Whether you choose to groove with Father Christmas or not, everyone can enjoy Christmas Day in Cape Verde which is marked with a gigantic firework display across the islands. A lot of people make the common mistake of thinking that the home of theme parks is only open to tourists during the summer months but Orlando has plenty to offer in the winter months. Both Disney and Universal Studios each have their own holiday experiences, Mickey Mouse’s Christmas Party and the Macy’s Holiday Parade respectively, and because the temperature rarely drops below 70°F you’ll never find yourself shivering. However, if you’re not a fan of theme parks there’s still plenty for you to do in Orlando with a Polar Express running from Mount Dora, incredible Christmas lights at Jeterbend and a spectacular Now Snowing festival in the town of Celebration, where the streets are coated in fake snow. While it may seem unlikely, Singapore is one of the best places in the world to spend the holidays. Although it’s not quite as hot as many of the other destinations on this list, the city stays around 80°F. In true Singapore style, Christmas transforms the city with areas like Orchard Road quickly becoming engulfed in Christmas lights to rival the best European and American displays. There are also some fantastic traditions, including a Christmas Eve countdown party on Siloso Beach as well as the chance to order a full Christmas dinner from many restaurants and have it delivered, cooked, to your door. If you want a more relaxed vibe throughout the Christmas period, with less commercialism and more reverence for the religious aspect of the holiday, then Cyprus is a brilliant destination. The island fasts for 40 days up to Christmas and throughout advent there’s constant singing from carollers each night. While you are likely to find many Christmas trees set up in the windows of living rooms, there’s also a tradition of placing Poinsettias outside that fills the street with crimson flowers. Importantly, Santa Claus doesn’t exist in Cyprus and is instead replaced by Saint Vasilis to maintain the holy focus of the holiday. In a similar vein to Cyprus, the island of Malta offers a much more traditional festive experience than many other European nations. Although you’re unlikely to see many Christmas lights as you walk the streets of Malta in December, the country has a tradition of creating extremely detailed nativity scenes called Presepji which have become a signature of the season. If you’re planning to visit over Christmas, make sure to go to the midnight mass at St. John’s Co-Cathedral in the nation’s capital, Valletta, on Christmas Eve – it’s a particularly special ceremony that involves a tableau of paintings from the famous artist Caravaggio. As one of the most popular destinations in the world, it’s hardly surprising that Dubai goes all out for Christmas. As the weather is often hot and balmy, the traditional turkey dinner tends to be moved outside, creating more of a street party feeling across the city. Many residents also take a leaf from Singapore’s book and order their Christmas dinner to be delivered from the city’s top restaurants. If you really want to get in the festive spirit you need to visit the Irish Village which hosts an annual Christmas Market complete with free mince pies. So, if you’re feeling the Winter chill and are on the hunt for some frost-free festivities there are plenty of destinations at Manchester Airport to help you find some Winter sun.